We stock a large selection of emergency medical and first aid supplies so you'll find what you need. 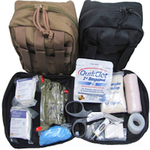 We pre build first aid kits such as Trauma specific, Military IFAK Kits, General Purpose or can customize one for you. Get a Medic Bag and build your own kit choosing only the supplies you want. Our staff is made of combat trained soldiers who know how to use what we sell. 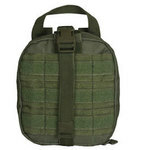 Great for bug out, Emergency kits, Outdoor EDC and more. Give us a call.